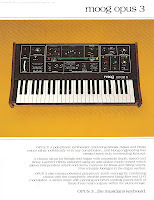 Moog Multimoog synthesizer reference sheet from 1980. I reference info. The more data the better. 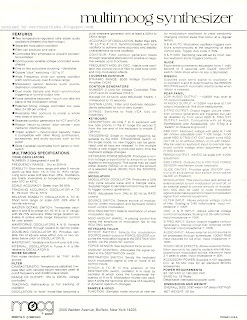 And this, and the other reference sheets deliver. Gorgeous photo on one side. Gorgeous info on the other. Yum. 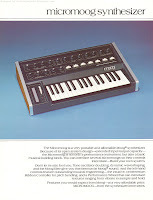 While recently flipping through old blog posts I noticed I never finished off my 1980 Moog reference sheet family. Well, time to fix that! 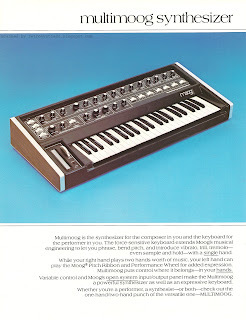 The Multimoog is probably the Moog synthesizer I'm least familiar with. 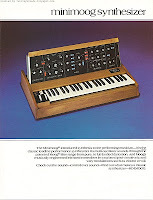 And at first glance, I had mistaken it for its baby brother - the Micromoog. Looking at the two reference sheets its easy to see why. 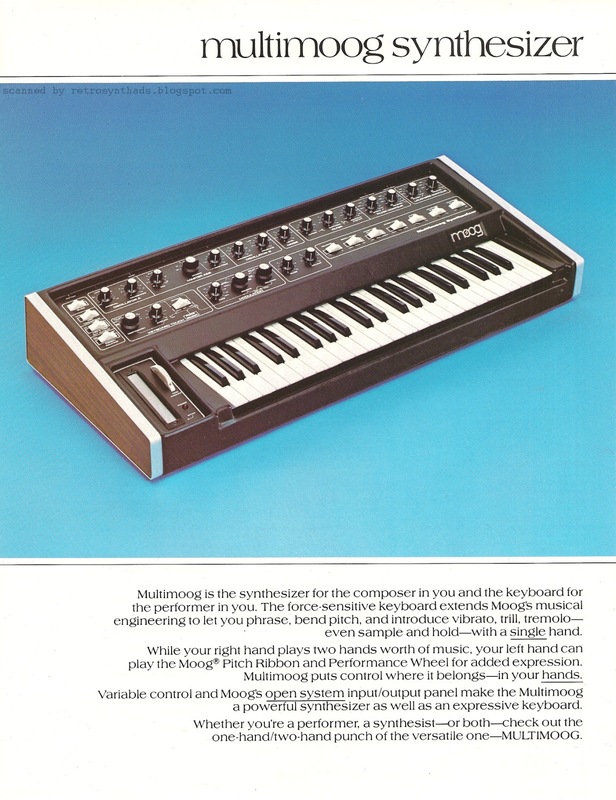 "Moog synthesizer: The Multimoog features two audio oscillators, an LFO, fully variable waveshaping, a 3.5 octave keyboard, switchable single or multiple triggering, a pitchbend ribbon and a modulation wheel. 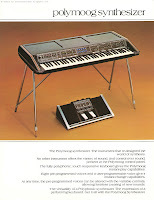 The keyboard also has a force sensor in it, the output of which can be used to control pitch, LFO speed, volume, etc. 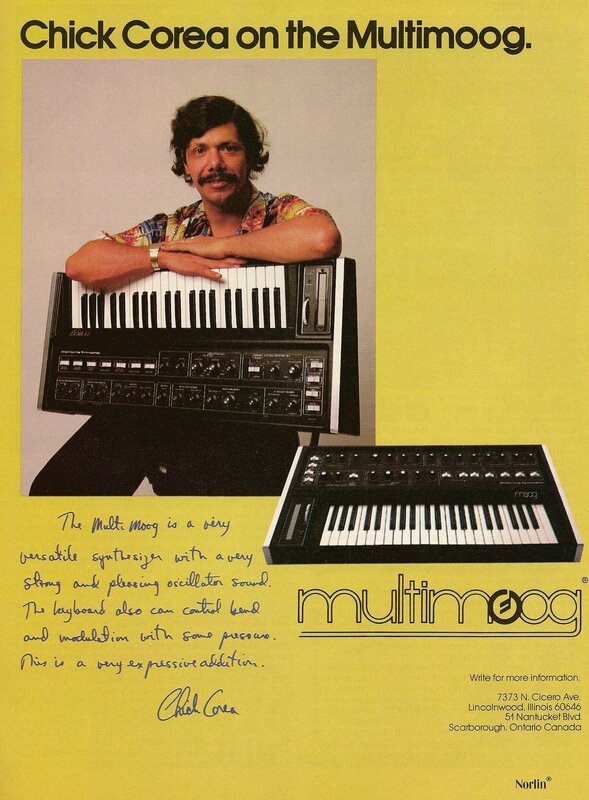 The Multimoog is basically an expanded version of the Micromoog and features many more open-system features not included on the Micro, such as glide output voltage on-off, ribbon control voltage routing, and keyboard triggering control. Norlin Music. 7373 N. Cicero Ave., Lincolnwood, IL. 60646." I have to say, I love the variable waveshaping on the Micromoog (waveform control knob that moves gradually from saw through square through narrow pulse waveforms rather than clicking to each individual waveform), and its looks like its implemented the same on the Multi. Sweet. "Multimoogs can be chained together. 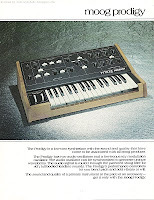 The back panel has a generous I/O system which lets a synth be a master or a slave unit." Whaaaaaat? Chaining Multimoogs? That's awesome. 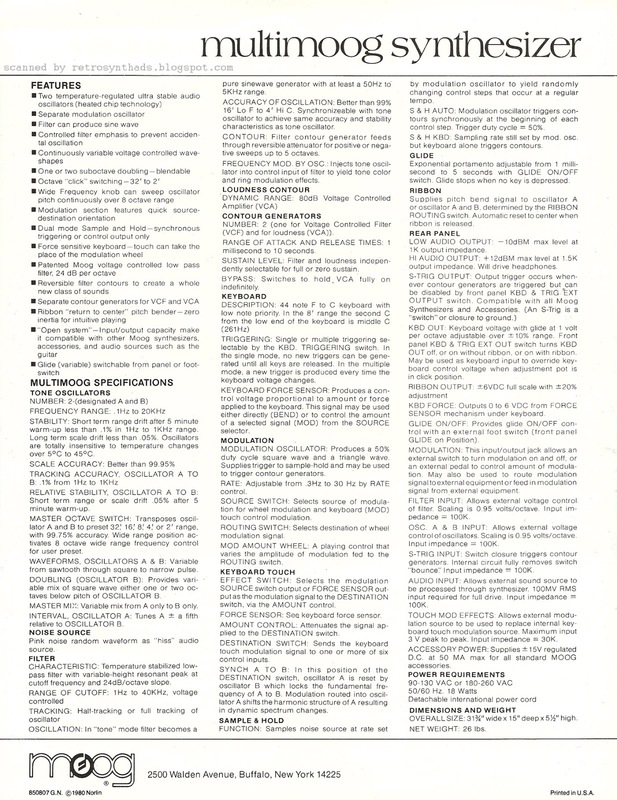 The back page of the reference sheet does list the jaw-dropping number of in's and out's the Multimoog ha, but unfortunately I couldn't find any videos of two Multimoog's joined together. Dang. 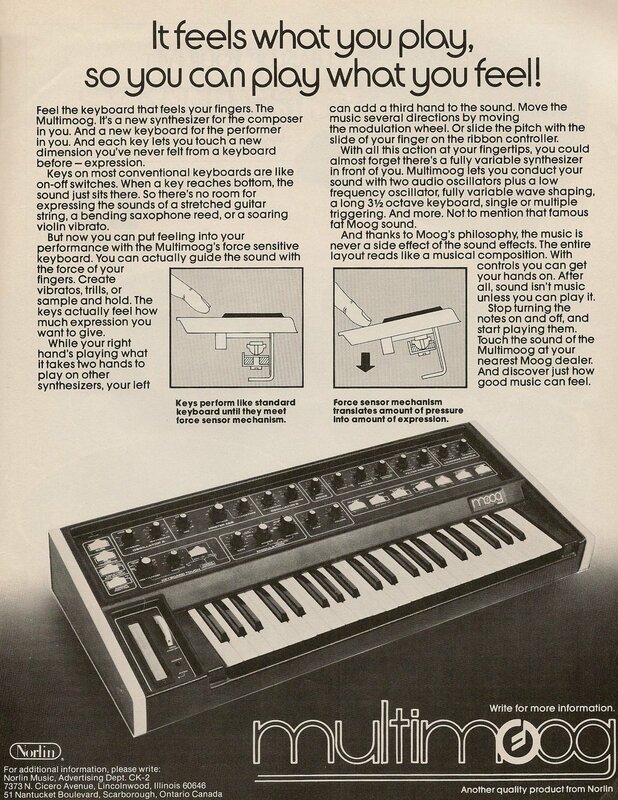 But I think anyone who has been hanging around vintage Moog forums and Web sites will agree its most outstanding feature is it's "force-sensitive" keyboard, now more commonly known as pressure sensitivity. 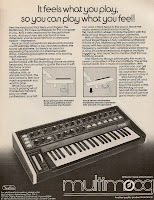 A nice - and rare - feature for a late 1970s synthesizer.